‘But the wise woman told me to bring a hair from your throat,’ said Harumi, shaking with fear. ‘My husband will die, he’s been fighting wars for years and he’s . . . In the original, the bear gives the woman a hair from the crescent moon on his throat. When she arrives back down the mountain the wise woman throws it away and tells her to be patient with her husband. I’ve missed the challenge for a few weeks but hope to get back to regular entries. This week Julia’s prompt is ‘the notes from the piano‘ and here is my attempt. They picked up the notes from the piano, each scrabbling to get the one with their name on. Josh, pack it in right? Beth and I are going to India. I’ve had all my jabs. Try not to worry, I’ll be fine. See you in a year; I’ll skype you. You know sometimes I think that I can’t get any dafter and then I surpass myself! Julia’s prompt this week is …it can’t be that time…. 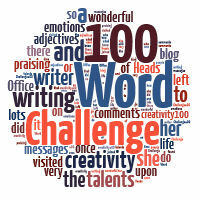 and as usual we can add another 100 words , making 105 this week. I feel squashed. I’ve tried pushing those hard bits, but they don’t seem to move now. It’s even difficult to stretch my legs and kick properly. We’ve both got hiccups, and I’ve been upside down for ages with my head in a vice, perhaps she’s been drinking? Oy, I do the shoving, stop pushing on my behind! Agh, I don’t bend that way, let me just . . . put . . . my . . . arm . . . down. What’s that now? Surely it can’t be that time already. It’s bright out there. I’ll need some sunglasses.